A new, exciting, and intuitive way to learn English, this self-study English practice book for beginners is uniquely visual, engaging, and easy to follow. 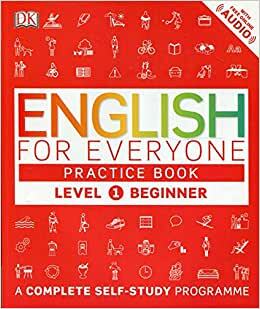 Packed with listening, speaking, reading, and writing exercises that reinforce key language skills, grammar rules, and English vocabulary, the English for Everyone Level 1 Beginner Practice Book offers beginners a clear and simple way to learn English as a second language. English for Everyone is a comprehensive course that uses innovative visual teaching methods to make the English language easy to learn. Level 1 of the course is suitable for complete beginners and introduces topics such as jobs and routines, leisure activities, and the home. The Level 1 Beginner Practice Book has a huge variety of bite-sized, attractively presented exercises to drill the language skills taught in the Level 1 Beginner Course Book. Free, extensive supporting audio featuring native English speakers is available online. The audio provides vital experience of spoken English, making even tricky phrases easy to understand and giving you the chance to perfect your pronunciation. English for Everyone is aligned to international standards for language learning, and ideal for preparation for major English-language exams. Whether you want to learn English for work, study, or travel, the Level 1 Beginner Practice Book will make teaching yourself English as a foreign language incredibly easy.